CANADA: Renewable energy developer Innergex reported a 36% increase in quarterly earnings and revenue mainly due to the commissioning of a 149.3MW Canadian project last year and the acquisition of six projects in France in 2016 and 2017. The Canadian company’s revenue of C$108.2 million ($85.3 million) for the third quarter represented a 36% increase on the same period in 2016. Meanwhile, the company’s quarterly earnings before interest, tax, depreciation and amortisation (EBITDA) for the quarter rose 42% year-on-year to C$81.8 million ($64.5 million). In its quarterly results, Innergex attributed the rise in revenue to the commissioning of the 149.3MW Mesgi’g Ugju’s’n project in Quebec last December and of the 81.4MW Upper Lillooet River and 25.3MW Boulder Creek hydro plants this year. The acquisitions of the 24.2MW Montjean Theil-Rabier, 44MW Yonne, 36.1MW and 44MW Rougemont 1 and 2 sites, 38.9MW Vaite and 22MW Plan Fleury projects in the last two years from several developers also boosted its revenue, Innergex said. The Plan Fleury site was commissioned in the third quarter. 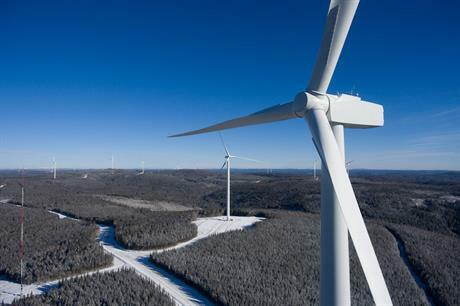 This increase was "partly offset", however, by lower production at its wind farms in Quebec, the developer added. Meanwhile, production and revenues from its newly acquired facilities also drove up EBITDA, Innergex stated, but it suffered "higher operating expenses, general and administrative expenses and prospective project expenses". Michel Letellier, Innergex president and CEO said: "In the past quarter, we are proud to have completed our fourth acquisition of wind farms in France. "The addition of our recently commissioned and acquired facilities contributed to our growth in revenues and adjusted EBITDA."